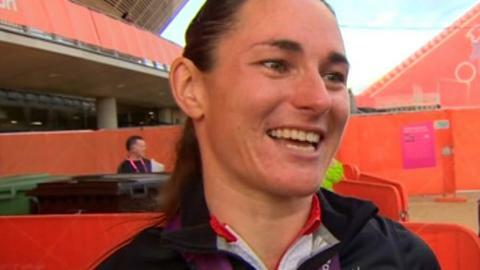 Sarah Storey swept to victory in the C5 Pursuit final to win Great Britain's first Paralympic gold of London 2012 and the eighth of her own career. The 34-year-old tore into the gap to Anna Harkowska and passed the Pole just after halfway in their 3km run-off. Storey, who broke a world record for the 72nd time in her career in qualifying, has another three medals in her sights at London 2012. Earlier, team-mate Mark Colbourne won silver in the C1-3 1km time trial. Storey and Colbourne's successes are the first contributions towards ParalympicsGB's target of 103 across the whole of London 2012. Cycling will be key to that total having delivered 17 golds in Beijing and Storey never looked like being denied a repeat of the Pursuit title she won four years ago. "I didn't expect to be able to catch her as quickly as I did," said the Briton. "Hopefully this race will set me up for the rest of the weekend. I suppose it did look easy but mentally you have to prepare and make it happen. I have to respect all my competitors." Until December the 34-year-old was also in contention for a place at the Olympics as part of the non-disabled team pursuit squad. "Sarah is Sarah. She wants to keep proving to the Olympic team that she needs to still be in consideration, alongside the younger generation that are emerging. She has put a time in there in qualifying that proves she is still world class and while there are four other people who the Olympic selectors thought were better than her last time, she is telling them not to overlook her. I'm sure she would jump at the chance to get back involved with the able-bodied squad." The trio of Dani King, Laura Trott and Joanna Rowsell were eventually preferred and justified their selection with gold in a world record time in the Velodrome earlier this month. Denied her chance to become the first athlete to represent Great Britain at both Games, Storey sent an ominous message to her Paralympic competition as she improved on her own C5 world record in qualifying. Her time of 3:32.170 would have been good enough for silver ahead of fellow Briton Wendy Hovenaghel at the non-disabled track world championships in Melbourne in April. Harkowska's own mark in the heats was 16 seconds slower and Storey immediately started reeling her in, opening up a six-second advantage in the first 1000m before bringing the final to an early end. Born without a functioning left hand, Storey's Paralympic career began back in Barcelona in 1992 where, as a 14-year-old, she won two swimming golds. In 2005 an ear infection which prevented her training in the pool prompted her to try cycling as a way to keep fit in the meantime. She never returned to the water. Colbourne's Paracycling career is far shorter, the Welshman having started the sport in the wake of a paragliding accident in May 2009. The 42-year-old underlined his promise as he added Paralympic silver to the three time-trial medals of the same colour that he has won at World Cup events so far this year. "I've worked for the last eight months towards this. A big thanks goes to all the coaches for getting me into the best shape possible," he said. "We've done this hundreds of times in training and it's about repeating the process. I probably only heard the crowd on lap three when I had relaxed into my stride." Six-time Paralympic gold medallist Darren Kenny finished outside the medals in fourth, however, as Chinese champion Li Zhang Yu left the rest of the field trailing by more than thee seconds with an extraordinary world record.